Well it's Saturday December 7, 2008, and Barack Obama is still hard at work naming people to assist him reshape America. 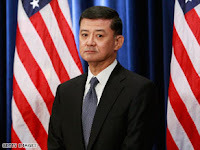 According to CNN, he just formally announced that a retired Army General, Eric Shinseki is his choice to be secretary of Veterans Affairs. Barack Obama has very high praise for him. In a recent press conference, Obama states "No one will ever doubt that this former Army chief of staff has the courage to stand up for our troops and our veterans. No one will ever question whether he will fight hard enough to make sure they have the support they need." Especially in todays economy, he claims that it is important to help troops who have served our country during bad economic times. His job will also be to reshape the VA to 21st Century standards. He will address the need of veterans being able to re-adjust easily to civilian life after service. He must make sure that there will be enough funding to provide proper health care for veterans that have earned the benefit by their service in the Armed Forces. Now, all that is left is his confirmation. This announcement took place on the anniversary of Japan's attack on Pearl Harbor in 1941. He had the position in the Bush administration, but because of what "he said that more troops were needed in Iraq than secretary of defense, Don Rumsfeld thought we would need at that time". Obama believes that he was right, and it looks like he will have the support to gain the confirmation for the position of Secretary of Veterans Affairs.